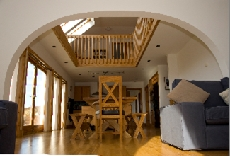 A stunning and substantial detached house designed by award winning Scottish architects, Sea Croft has an elevated position on the Sleat peninsula in the south of Skye, with breathtaking views to the islands of Rum and Eigg. 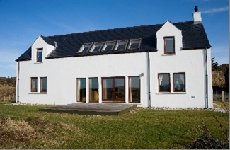 A stunning and substantial detached house designed by award winning Scottish architects, Sea Croft has an elevated position on the Sleat peninsula in the south of Skye, with breathtaking views to the islands of Rum and Eigg. 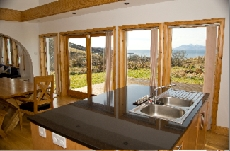 It is within a 5 minute walk of the beach and Tarskavaig Point with dramatic views of the rugged Cuillin mountains. The house stands in a quarter acre of mainly grassed garden, with a decking area accessed by patio doors from the dining area, so the wonderful views may be enjoyed when sitting either inside or out. The internal design is indeed stunning. There is an impressive kitchen-dining area with soild oak wood flooring and a high ceiling with velux windows to give maximum natural light. An arch leads through to the sitting room with woodburning stove. 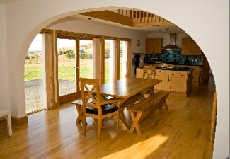 This, with underfloor central heating and double glazing, ensure that the house is a cosy place to which to return after a day in the hills or sightseeing. There is a downstairs double bedroom with en-suite double shower. Stairs from the living area lead to a gallery which provides additional seating with a spectacular outlook to the Isles. Off this are three more bedrooms and the family bath and shower room. Bed linen, towels, oil CH, electricity and logs INCLUDED. Two pets by arrangement. No smoking. Sea Croft has been a lovely holiday home for us, thank you so much for all the welcoming touches – the dog bowl ready for a travel weary hound was a lovely touch! We have spent most of our time exploring this side of the island, enjoying walks and wildlife a plenty; seals and otters at Dun Scaith Castle, an eagle and buzzards at Point of Sleat and even an angry adder at Loch a-Ghlinne. Spent some lovely days returning to Sea Croft to sit and gaze out of the window at the ever changing panorama of Rum, beautiful! Sea Croft has been welcoming and homely. The finishing touches were very much appreciated. The views speak for themselves. We can also recommend "The Smokehouse" at the end of the road and the food at night at the Eilean Iarmain Hotel was fantastic. Also the lunch at the Broadford Hotel was good (12-2). The wildlife is both beautiful and entertaining. We look forward to a return! Sleat is known as ‘the Garden of Skye’ which, lush and green, is entirely different to the rest of the island. 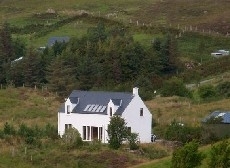 The traditional crofting community at Tarskavaig is reached by a single track road from the main Armadale-Broadford highway, readily accessible either by bridge or ferry from the mainland. Rarely indeed will you not find yourself face to face with deer as you make your way to the other side of the peninsula. The coast line on this side is quite stunning, rugged with rocky headlands, beaches and the ruined castle of Dun Scaith to explore, all affording great opportunities for waterside picnics, with arguably the best views of the Cuillins on the whole of the island. Look out for seals here, they are perhaps as common in the water as the deer on the hills! 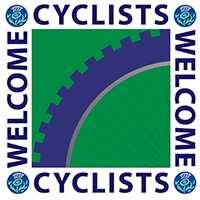 Walkers and climbers will hurry off to the Cuillins. For something less strenuous and closer to home, you can take boat trips from Ardvasar (shops, café, hotel) or visit the gardens and visitor centre at Armadale Castle. To the north, Broadford is the place to go for supermarket shopping and petrol and beyond there all the attractions of Skye await – Portree, Dunvegan Castle and the Coral Beaches, the Old Man of Storr and the Quirang, the golf course and the ferry to Raasay at Sconser – the list goes on. Sleat is also well off for excellent places to eat. 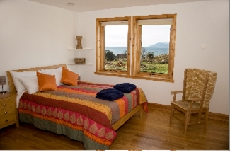 The Hotel at Eilean Iarmain does excellent bar meals and has regular celidh evenings, or for another special evening out, you can visit Lady Claire Macdonald’s Michelin Star resturant at Kinloch Lodge.